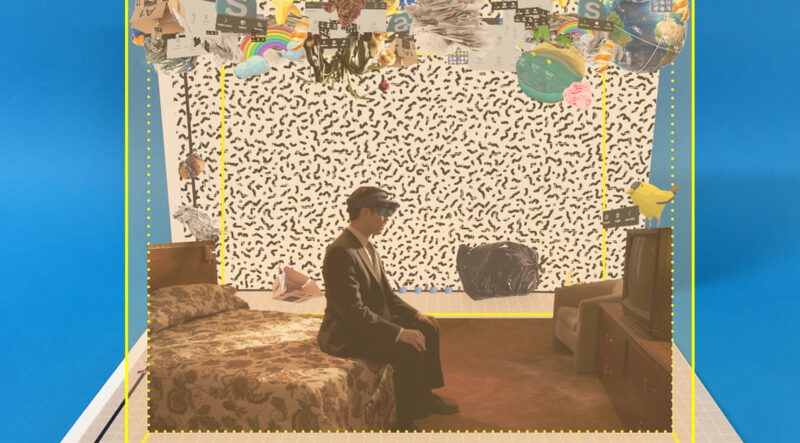 A course in augmented and virutal reality explores the in-between realities of immersive living. 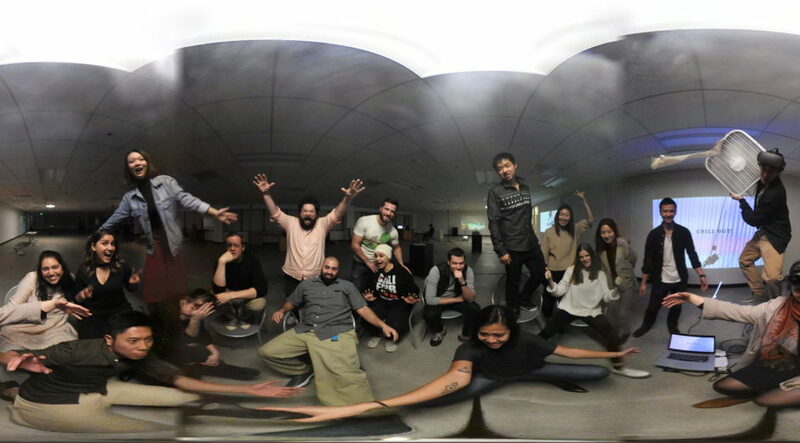 Class photo in the Immersive Media Lab, ArtCenter College of Design. As virtual reality and augmented reality technologies become increasingly ubiquitous and cultural acceptance grows, how might these technologies begin to permeate through our world, making immersive experiences more routine? This was just one of several questions about VR and AR posed in the recent course “Everyday Immersions”, a 4-week studio for /Lab Concept students. The class utilized ArtCenter’s new Immersive Media Lab, a fully equipped virtual and augmented reality classroom to run workshops, host talks, and help students design with the technology. During the studio, students completed a set of three projects that were speculative and provocative, using the performances of everyday life, which proposed new opportunities within the field of VR/AR, immersive media, and design. The graduate projects will inform an upcoming undergraduate, transdiscplinary VR+AR+MR studio. The class challenged the idea of a singular vision of how VR or AR will ultimately fit (or not) within our pre-existing rhythms, rituals, and routines. Other questions that arouse included: How will augmented layers of sensing technologies and media begin to shape the material surfaces of our places, things, and bodies? What new strange juxtapositions of views, aesthetics, and interactions will be created from this layering, mixing, reflecting and collaging of experiences? Will these seamed experiences and resolutions assimilate, mingle, or interrupt? MDP welcomed many guest critics and lecturers during the studio to lend their expertise and guide students in their research. They included Lulu Mendelova, PhD, New Media Artist; Henric Jentz, Principal Designer, Microsoft Devices; Nicholas Kamuda, Creative Director, Microsoft HoloLens and Windows Holographic; Yasaman Sheri, Designer, Microsoft HoloLens; Andrew Nagata, Game developer and Entrepreneur; Joshua Walton, Design Architect. Through 3 assignments, students explored Virtual Reality (VR) and Augmented Reality (AR), and their expanding array of immersive technologies — hardware, software, spatial sensors, cameras, interfaces, controllers, and head mounted displays (HMD) that read and interpret the real world (assignment 1), combine it with the virtual (assignment 2), and in the process, blur the boundary in-between (assignment 3). Through this complex layering of the real and virtual, the tangible and intangible, we understand the relationships between a person, their body and their brain. We change the way a person perceives the middle of these layers, somewhere new. They are in-between realities, in-between places, and in-between their real self and their virtual representation. Welcome to immersive living, a new type of “reality”. Inspired by discoveries and possible implications, students are first assigned to come up with projects that are engaging, speculative, and provocative, using the performances of everyday life (now in multiple resolutions, places, and bodies.) In the second assignment, they propose new opportunities within the field of VR/AR, immersive media, and design (avoiding stereotypical AR/VR content). Nicci Yin and Nan Tsai proposed a mixed reality “transition zone” between real (RR) and virtual (VR) realities. 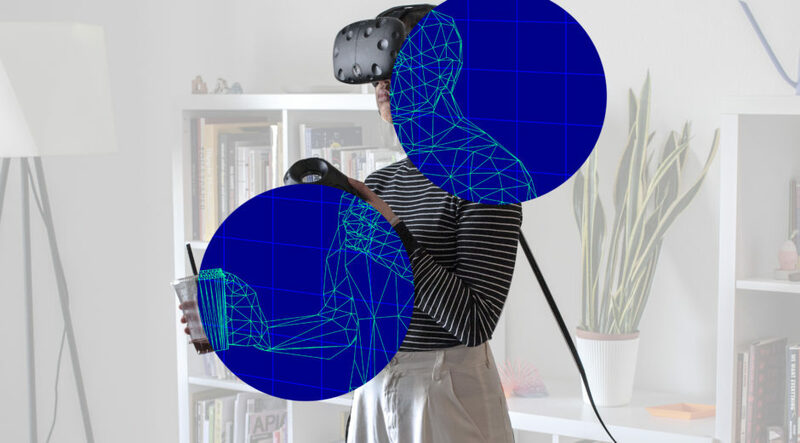 This “transition zone” is inspired by the “play space” in setting up the VIVE, and incorporates scanning the physical infrastructure (furniture, objects around you, VR hardware) into the mixed reality experience. 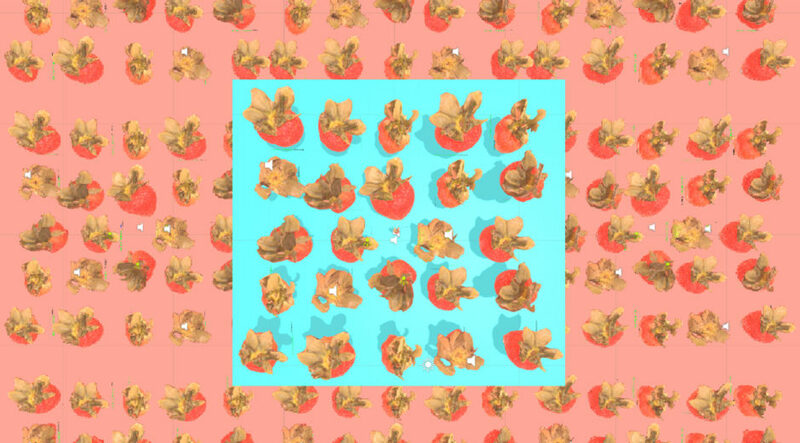 Sally Liu meticulously hand scanned strawberries and enlarged them to double human scale to create an immersive e-grocery where you can marvel at each individual seed on a strawberry. 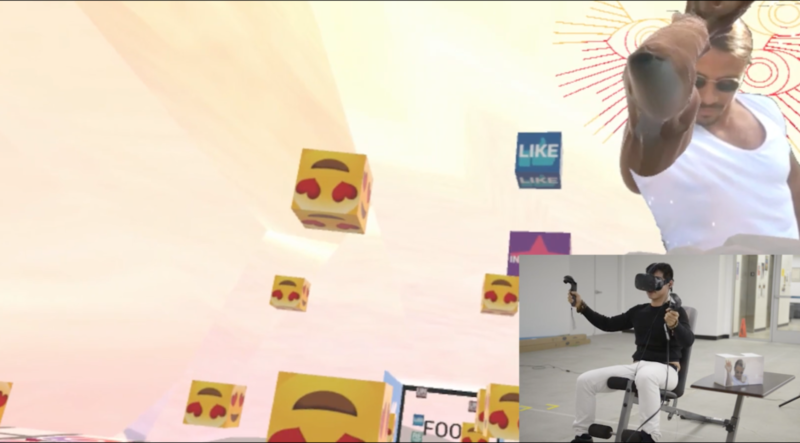 Howard Zhang created an intense VR workout routine that combines the dopamine hits of Virtual Reality with that of social media and physical exercise. Claire le Nobel, Jason Wong and Michael Milano immerse users into the experience of everyday objects, exposing them to a macroscopic sea of sound and visuals. Stephanie Cedeno and Godiva Reisenbichler wonder when do digital objects become trash in augmented reality and where do they go when they are discarded. 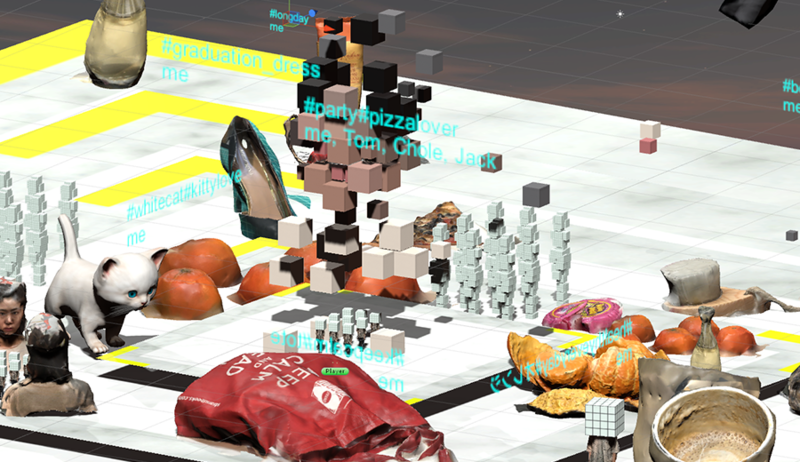 Reversing gravity in the augmented space they create a dynamic strata of trashed 3d models on our empty ceilings. 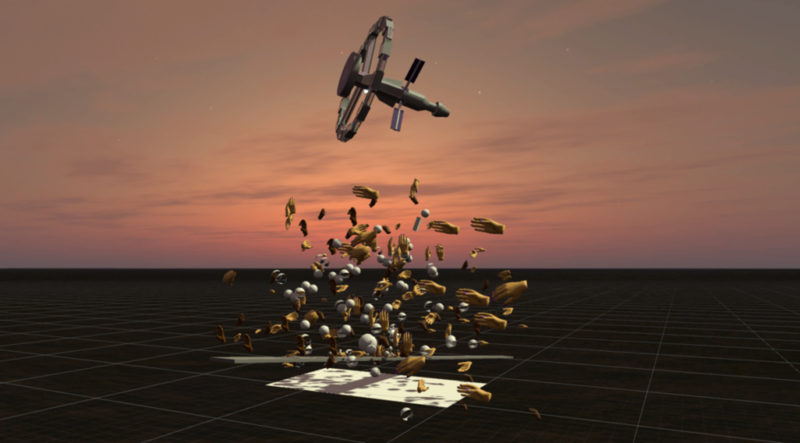 Yidan Sui and Yeawon Kim re-imagine social media in VR as an ever expanding spatial archive of personal memories and consider the cultural implications of scanning a physical and mental body of oneself. Kiana Bahramian explored the loss of the physical presence of our bodies in VR and how they are replaced by proxy body parts and 3d models of controllers.